BBC NEWS | Business | What exactly is in your beer? What exactly is in your beer? Fancy a refreshing pint of betaglucanase? Or maybe a thirst-quenching glass of propylene glycol alginate? These chemicals do not sound remotely appealing. 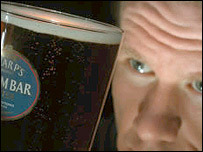 But if you have ever had a pint of cheap lager or ale, it is likely that you have sampled both of them. Each is an additive commonly used in the production of mass market beer: betaglucanase can be used to speed up the brewing process, while propylene glycol alginate can be added to help stabilise a beer's head of foam. Although both are safe food additives, they hardly sound tempting, and beer drinkers would most likely wish to avoid them. At present, though, beer producers in the UK and across most of the European Union (EU) are under no legal requirement to list all their ingredients on bottles or cans. And while premium beers proudly indicate that they only use the four historic core ingredients - water, malted barley, hops and yeast - others give no more detailed information than the current legal requirement: to say that their beer includes malted barley or wheat. In many cases, therefore, the buyer has no idea whether or not his or her beer of choice has been brewed naturally, or what else might have been added. This situation - which also applies to all other alcoholic beverages - stands in sharp contrast to the stringent rules which apply to other packaged food or drink products. However, all that could be about to change. The European Commission is now reviewing its entire range of food labelling - including whether full ingredient lists should be extended to the drinks sector - with the aim of producing a new framework by the end of this year. If the change to alcohol labelling is enacted by Brussels, it would have to be adopted by all 25 EU member states. The UK's Food Standards Agency (FSA) is conducting a public consultation on the issue to inform the UK's government's response to the Commission's preliminary proposals. The brewing industry is among its consultees. "The agency is, in principle, in favour of extending ingredient listing to all alcoholic drinks, provided there is a thorough public consultation beforehand," said an FSA spokeswoman. But until a new law is passed by the European Union, brewers across the continent will be able to add chemicals without fear of putting off the drinker. With one rather notable exception: Germany. With more breweries than any other country, the Germans take the purity of their beer exceptionally seriously. Ever since the German Purity Law or Reinheitsgebot of 1516, beers in Germany can only legally be produced using the core ingredients of water, hops, yeast and malted barley or wheat. Forget chemicals; German brewers are not even allowed to add sugar or lesser grains such as maize or rice. 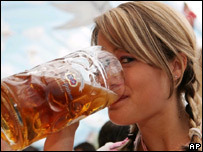 Perhaps, then, it is hardly surprising that fans of German beers insist that they taste "cleaner" - and swear that they cause less of a hangover. 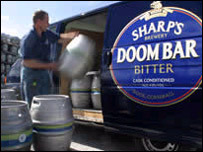 Back in the UK, however, the great majority of smaller brewers also insist on only using natural ingredients, such as Sharp's Brewery in Cornwall. Its head brewer, Stuart Howe, says only large brewers are tempted to go down the chemical route. "You would only be tempted to start adding chemicals if you were producing on a vast scale and needed to speed things up - if you have that pressure to be as quick and profitable as possible," he says. "We are a small operation here, so we simply don't need to use any additives. "The larger brewers are also under pressure to produce as consistent a product as possible, and will be looking at everything on a molecular level. In such cases you can add chemicals to better control the biological process. "We just allow the biological processes to happen, so you get minor inconsistencies between each batch, but that's natural." 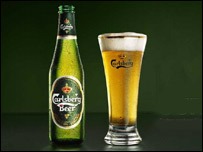 Brewing giant Carlsberg currently does not list its full ingredients on its packaging. When asked, though, the firm says its lager only contains water, yeast, malted barley and hops. Ian Hannaford, its senior brand manager, says its current labelling complies with existing legislation and is "consistent with other brands within our category". UK beer quality pressure group Camra (Campaign for Real Ale) says it has long called for beer and other alcoholic drinks to have to list their full ingredients. "Consumers deserve to know what goes into their [alcoholic] drink in the same way as they would any other product," says Camra research and information manager Iain Loe. "Brewers shouldn't have anything to hide." Is today's beer all image over reality?